The reaction was predictable. It was about as predictable as a between-the-tackles run out of a three tight end set. In his press conference following Boston College football’s (4-5, 1-5 Atlantic Coast) 52-7 thrashing at the hands of No. 7 Louisville (8-1, 6-1), Steve Addazio fielded a question about his defense’s slipping performance. Specifically, he was presented with the fact that it’s already allowed 15 touchdowns of 20 or more yards in 2016, after allowing only five during the entire 2015 season. Addazio was asked if he could identify a reason for the slippage. Before the question even concluded, the Eagles’ head coach directed his anger at the person who dared to offer this question. While admirably trying to deflect attention away from his players’ performance, Addazio gave the impression that the quality of the opposing offenses that the Eagles have faced this season outstrips that of last year’s slate. Using that statement as an open invitation, let’s compare this season’s opposing offenses to last year’s. According to Football Outsiders’ Offensive S&P rankings, which only include matchups against FBS programs—and thereby exclude games against Maine and Howard in 2015, and against Wagner in 2016—the average ranking of the Eagles’ opponents in 2015 was 53.3. The team faced four opponents with a top-35 offense. 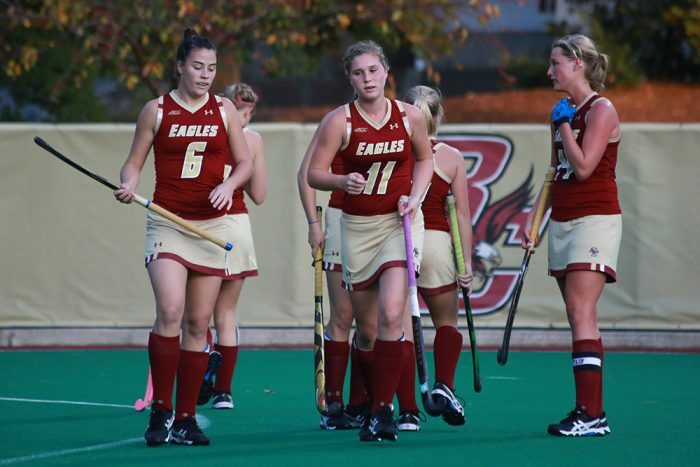 Thus far, throughout nine games in 2016, BC’s opponents have an average ranking of 56.6, with just two games coming against top-35 offenses. While Addazio’s recent memory is correct—Louisville’s top-ranked offense in 2016 is easily the best unit the team has faced over the last two years—BC has actually played a slightly easier schedule of opposing offenses in 2016. Next, since the question pertained to explosive plays, let’s take a look at the big-play capabilities of the Eagles’ opponents over the last two years. In 2015, the team’s average opponent had a ranking of 54.2 in Football Outsiders’ IsoPPP+ metric, which tracks a team’s ability to generate explosive plays. This season’s opposition has averaged a ranking of 54.9 by the same statistic. The team has only faced one top-15 team by this explosiveness metric in 2016 after facing three top-15 teams in 2015. This season, BC’s defense has conceded three times as many touchdowns of 20 or more yards than it did last season, while the team’s schedule hasn’t featured a corresponding uptick in explosive offenses. Even excluding the four such touchdowns scored Saturday by Louisville, the results that prompted Addazio’s response, the Eagles would still have allowed 11 explosive scores. With opposing offenses sporting neither a better average ranking nor explosiveness than those faced last year, it’s pretty clear that the increase in long touchdowns allowed is due to struggles on defense, specifically in the secondary. The defense has struggled greatly with offenses that push the tempo, a fact brought into excruciating clarity following the losses to Clemson and Syracuse that concluded the team’s month-long October homestand. Against the four opponents that rank in the top-30 in Football Outsiders’ Adjusted Pace metric, which considers how many plays a team runs relative to an average team with the same time of possession, BC has conceded 11 touchdowns of 20 or more yards. In comparison, against its three top 30 opponents last season, the Eagles only gave up two such scores. An inability to halt drives dooms BC against these offenses. Last season, BC’s defense ranked second nationally by allowing just 18.3 percent of drives that conceded one first down to end with a touchdown This season, that number has ballooned to just over 40 percent, 79th in the country. A large portion of the blame for this decline falls on the secondary. The defensive backfield ranks a dreadful 103rd in Football Outsiders’ Havoc Rate, which measures tackles for loss, passes defensed, and forced fumbles. Unable to consistently force incompletions, the secondary has become highly reliant upon the front seven to cover its mistakes. The brilliance of BC’s pass rush, a unit led by superstar Harold Landry, who leads the nation with nine sacks, is a big reason why the Eagles rank fourth defensively on passing downs, defined as a second-down play with 8 or more yards to go or a third or fourth down with 5 or more yards to go. When the opponent is in a situation in which they must throw the football, the pass rush can pin its ears back, with eyes only on the quarterback. Third downs against Landry & Co. are an experience in which no quarterback wants to partake, as they have little time to read the defense and look for an open receiver. This gives the secondary a reprieve. The issue for the Eagles, however, has been getting opponents into third and long scenarios. On standard downs, defined as all non-passing downs, the Eagles rank 79th in the country, after ranking 10th in those situations last season. When the front seven must also worry if the opposing offense will run the football, the pass rush is slowed. As a result, when passing on these downs, quarterbacks have more time to throw the football, setting their feet and going through their progressions. The extended time in the pocket gives them time to dissect a secondary whose performance has slipped since last season. Often, teams will string together a few consecutive passes for first downs, discombobulating the defense, before breaking off a massive play. Having established the secondary’s struggles, the next question to ask is whether they can be attributed to personnel or schematic issues. Somewhat unsatisfactorily, it appears to be a little bit of both. Certainly, the loss of safety Justin Simmons to the NFL’s Denver Broncos has left an irreplaceable hole in the middle of the defense. Simmons patrolled the middle of the field with authority, doling out huge hits to receivers crossing in front of him and instinctively breaking toward receivers who had beaten their defender. Though William Harris and John Johnson are an above-average safety tandem, neither is as adept at plugging leaks in the secondary as Simmons. While the cornerback rotation has largely been the same, though Gabriel McClary has seen an increased role in 2016, their play has been placed on center stage more frequently. Teams appear to have determined that the best way to attack BC’s defense is to target receivers covered one-on-one by members of the secondary. Whether this is because they feel the secondary represents a real weakness or because the Eagles’ run defense is so formidable, they have repeatedly sought out the defensive backs to the tune of increasingly excellent results, particularly on downfield throws. At least some of this success stems from BC’s steady commitment to man coverage on the outside, with varying degrees of safety help over the top. Against Louisville, on Lamar Jackson’s 30-yard and 44-yard passing touchdowns in the first quarter, the Cardinals receiver who caught the pass was matched up in single coverage with a BC cornerback, with no deep safety in sight. When the Eagles did put in a deep safety, results improved. Johnson intercepted Jackson on a play where he broke from the deep middle to the sideline, beating the Louisville receiver to the spot. Another solution to the problem would be to sprinkle in more zone coverage. Addazio said after the game on Saturday that, while he has kept the core tenets of last year’s defense, he has utilized some more zone schemes. No matter what defense was called against Louisville, however, Lamar Jackson ruined it. Perhaps some increased combination of zone and deep safety help would discourage opponents from constantly targeting Eagles’ cornerbacks down the field. While this exercise involves speculating on some things that only a coach could decide, what isn’t up for debate is that the Eagles’ schedule has not had a significant impact on their secondary’s decline. This issue lies within the locker room, not on the opposing sideline. It’s not as though the Eagles have suddenly rolled out an FCS pass defense—this season’s unit ranks 52nd against the pass, by Football Outsiders’ S&P metric, after ranking 14th last season. The decline is just made more noticeable by the degree to which this team relies on its defense, with an offense that scores only 21 points per game. The issues are not impossible to solve, and there remains plenty of talent in the secondary. But the solution can only be found once the source of the problem is acknowledged. And based on Saturday’s press conference, that process still appears to be ongoing.